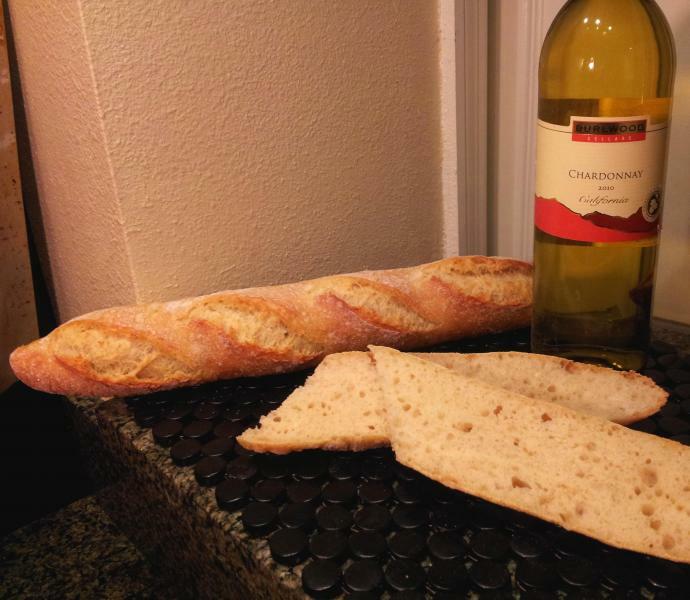 After having a successful first try at my first of two recipes I will bake for a year, my sourdough boule, I gave DonD's recipe for Baguettes a l'Ancienne my best. I will say a good baguette is not as simple as it may seem, and I feel this recipe will take more time to become proficient. Mix flour and cold water into a doughy blob. Temp of dough after mixing 63.7F. Place in fridge for 12hr at 42.2F. Pull flour mix out of fridge and mix in 50g of cold water and yeast. This was um...difficult at first. Between freezing my fingers and fighting the slimy mixture I finally brought it together, about 10 min. Then add the salt and knead until distributed evenly, using Bertinet's method. Let the dough rest for 15 min, then began 1st of 4 S&F's at 30 min apart and then 2 S&F at 45 min apart. Place dough in oiled bowl, in to a plastic bag it went and then in to the fridge (44.2F) for 24hr. Pull out of the fridge, gently divide into three 270g pieces and gently preshape into a fat log. I used Ciril Hitz's method for prehaping and shaping. Cover with plastic and let rest for 1hr. Preheat oven to 490F. I gently degased and shaped then proofed en couche for 45 min seam side up. Misted sides of the oven, transferred baguettes to baguette pan, scored and placed in oven with 2/3 cup of boiling water. Immediately turned oven down to 460F. Bake for 10 min then remove pan with lava rocks and reduce to 430F for 10 min. Then turned off oven and opened the door and let the baguettes sit for 5 min. Allowed to cool for 30 min. My results are as follows, but not exactly what I wanted. Crumb was no where near what I wanted or comparable to DonD's wonderful baguettes, but then again I have only just begun. Maybe no degas the next time and some work on shaping and scoring wouldn't hurt. Crust color was a little light. Any tips? What is the purpose of the rye in the recipe? The inside was nice and soft with a thin crunchy crust but I thought the taste was a bit off. In all honesty a may have forgotten the salt but I can't remember, mise en place right? So, the no salt could have been the culprit, not totally sure I forgot it though. Anyways I'm open to suggestion, critques or comments. Thanks! First of all.....for a first time effort at baguettes, your loaves are beautiful. And you are right, this is a recipe (and techniques) that require practice and a lot of it. The rye is in the recipe for flavor and though it may seem surprising, that small amount of rye adds a huge amount of flavor. Possibly you would like the bread without the rye, try it and see. You are off to a great start, really great. Thank you! I really try to pay attention and retain all the info from the videos, books, and other blogs I read. I think the next time I will nix the rye and degas and try a softer hand at shaping. I wont forget the salt this time either. I'm the worst at scoring but if you look at the top of the baguette and divide it in 3rd's length wise, the middle 3rd will be about 1" wide and 24" long. All the slashes go in this 1/3 middle space that is 1" wide. Overlap slashes about 30% and go for 5 or 6 of them. I noticed yours are running out of this middle 1" area and more across the length of the bread than down it. This is something you can quickly fix, you bread will instantly improve and hopefully you aren't as slash challenged as I am - wouldn't want to wish that on anyone. In no time you will have it down pat. I always have it visualized in my head where I want the slashes to go then once the razor hits the dough I go crazy, maybe next time I'll breathe a little. Isn't the dough at 70% hydration with the rye? 350/500. Yeah, I don't plan to tackle the higher hydration until I am happy with my basic skills. I really appreciate the comments and hopefully I can put them to good use next time! had some fat fingers on the calculator. No need to go much lower on hydration with an all white baguette -maybe 68%. It might feel wetter than the rye one. KAF's standard all white baguette is 66.7% from their web site. Thanks! I think I'll try the 70% again because it wasn't too bad, but if I struggle I'll reduce it. 1st Bake in 2 YEARS!! Sourdough Boule No. 4 Success!